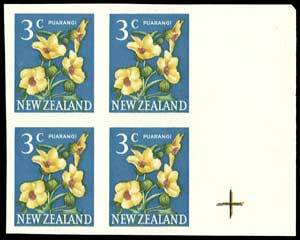 Virtual New Zealand Stamps: 1967 - 1968 Decimal Pictorials - Part Four. Back to 1960 - 1966 Pictorial Definitives. Forward to 1970 Decimal Pictorials. 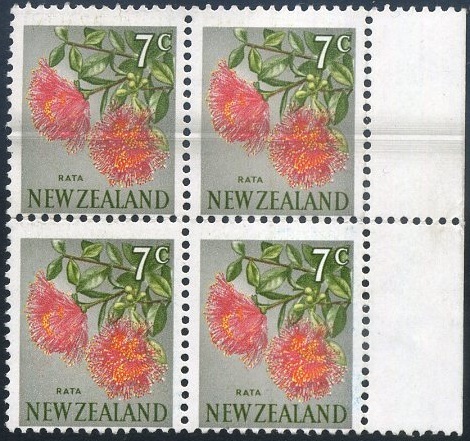 An overview of this definitive issue with First Day Covers. 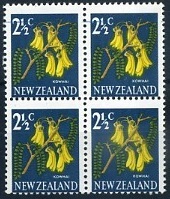 Various extra issues that appeared over the next two years. The information on the designs/subjects of each stamp in more detail. Flaws and errors in the lower values. 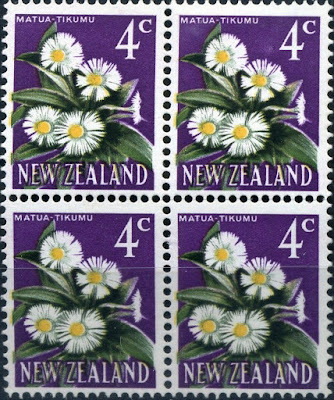 1967 - 1968 Decimal Pictorials - Part Five. Flaws and errors in the higher values. Now we get to some of the errors found in this definitive issue. In this post we will be looking at the low values, the native flower stamps. While we have a good collection here I do believe there are many flaws from these values that we have missed. Therefore I suggest that it might be worth check back on this page from time to time to view any new items. 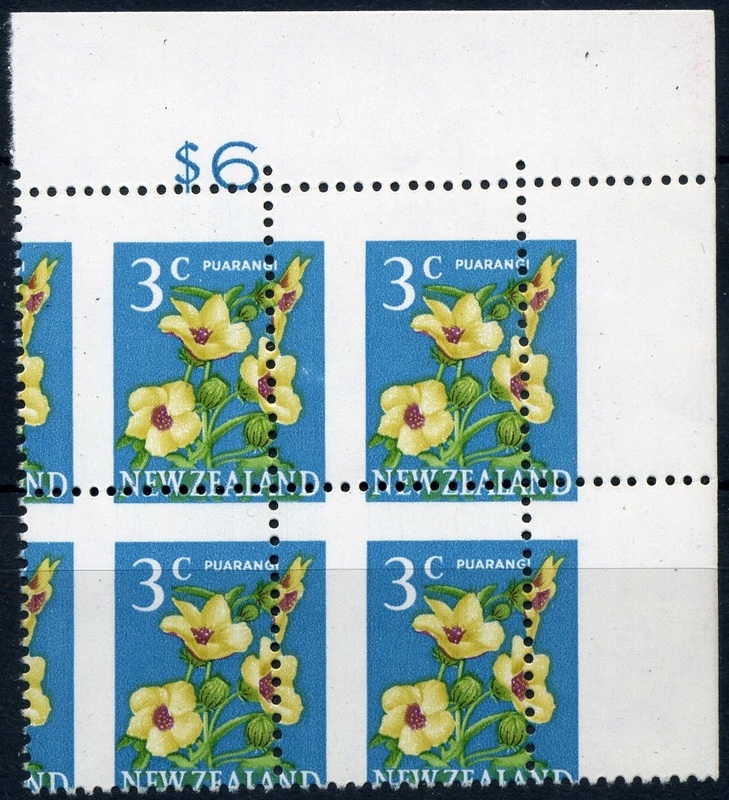 1967 Pictorial ½c selv pair and a selvage block both with the same grossly misplaced perforations. 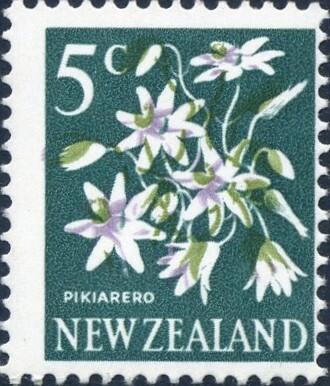 Green is completely omitted from this postal used example. 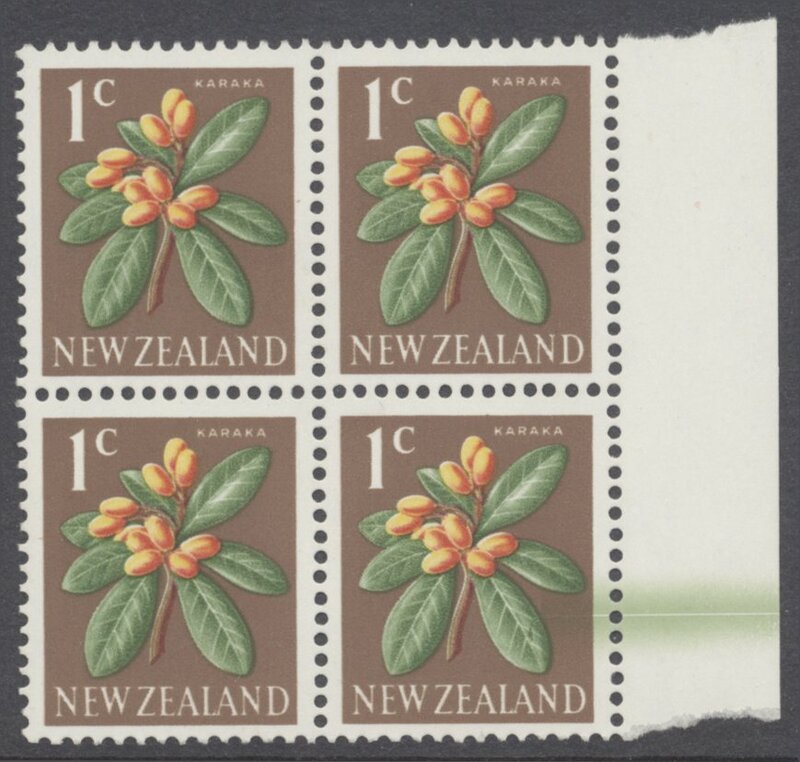 1c Karaka selvage block of four, with a Dr Blade flaw in green. A green colour shift to right has caused the leaf tips on the left to appear white. In the left-hand pair a doctor blade flaw in the blue down the left selvage. 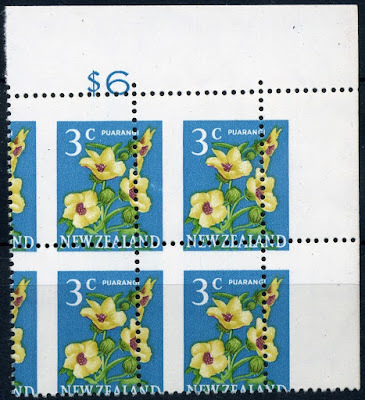 Perforation error where the perfs are now touching the bottom of the design in this four stamp block. 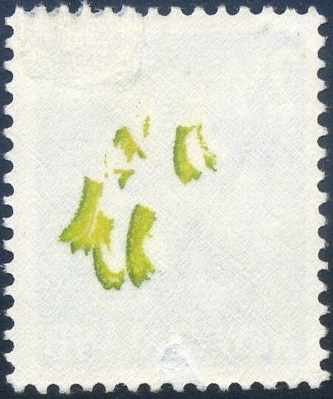 Yellow/green offset on back of this stamp. 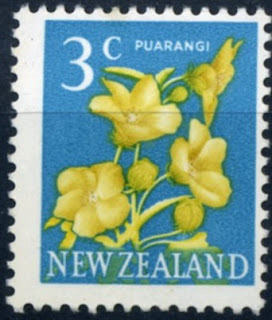 3c - Puarangi / Hibiscus. 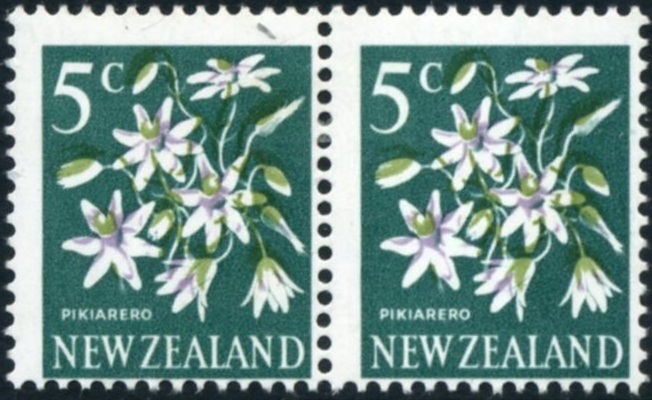 Two examples of the 3c Puarangi Flower with huge perforation errors. 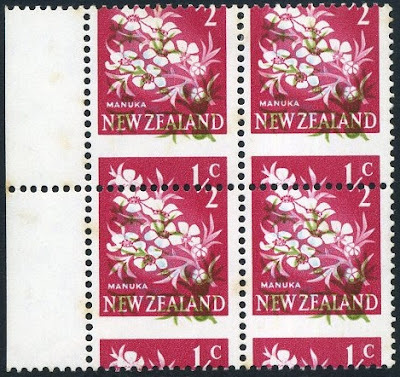 The block on the right is particularly interesting since it is also a value block as well. 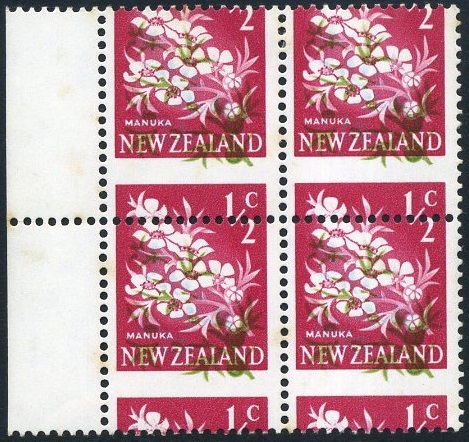 2 examples of imperforated blocks. 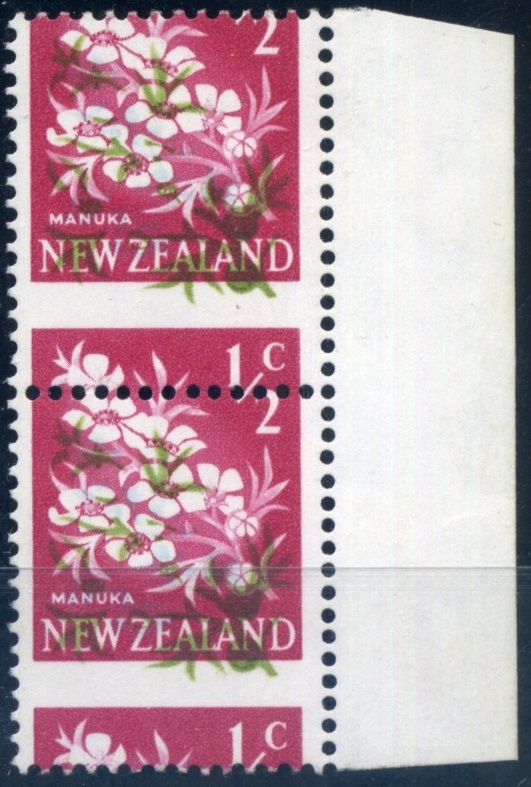 In this example of the 3c Puarangi the blue/purple has been completely omitted. This colour was mainly used to mix with the yellow to make the dark green leaves of this flower. 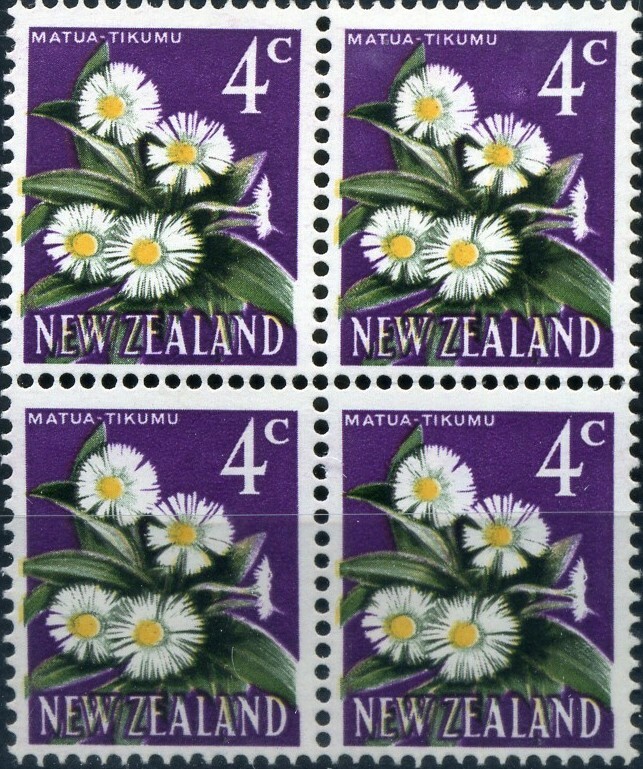 4c - Matua Tikumu / Mountain Daisy. 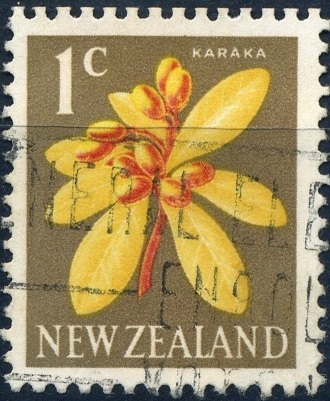 This stamp suffered a lot of problems with the yellow shifting. In this case it is a minor shift but much larger shift have been found. 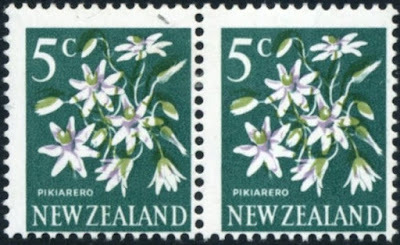 5c - Pikiarero / Clematis. Both of these examples show colour shifts. Above the blue/green back ground colour has moved down & to the right. In the pair below the olive green has moved upwards. In this 7c Rata Flower block Four, top row has nice Dr Blade flaw of grey background colour. Back to Part Three. Forward to Part Five.